This is an excellent set of first toys at a fairly reasonable price. Rattles, links, teether -- all must-haves for baby's earliest collection of toys. This is an excellent set of first toys at a fairly reasonable price. Rattles, links, teether -- all must-haves for baby's earliest collection of toys. This is an excellent set of first toys at a fairly reasonable price. 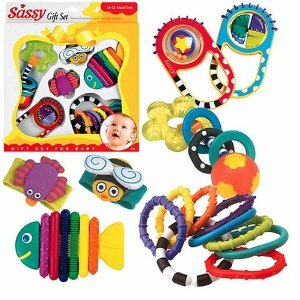 Rattles, links, teether -- all must-haves for baby's earliest collection of toys.